Do you have an artistic flair for putting large projects together? When other people talk about heroes, do you automatically think of Scorsese, Spielberg, Howard and Tarantino? Directing could be for you! Creative decisions on a production are made by a director, often in line with several area-specific assistants. You would be active not only during production of the enterprise, but also during pre- and post-production operations. You would choose and direct actors for different roles and give them direction on how to portray a character. Working with a variety of art, set, costume and other directors, as well as editors and special effects personnel, you control the artistic aspects of the production, reporting to and working with the executive producer. A director must have exceptional skills in communication, creativity, management and leadership. You must work well under pressure, both because of production issues and having to g new work on a regular basis, as work assignments typically last anywhere from a day to several months. You must have determination to continue working when filming in poor weather conditions, pulling long hours and without many breaks or days off during filming. Directors typically have a minimum of a bachelor’s degree, usually in a related field such as writing, journalism, theater, acting, film or communications, as there are no specific programs available for directors. A master’s degree in fine arts is very helpful for advancement in the field. After completing an educational program in a related field, you would go through several years’ of work experience, including acting, writing, film editing, choreography and assisting established directors on a set. As your reputation grows, you will have opportunities to work in larger and more expensive productions. Actors portray characters in plays, television and motion picture media, conveying emotion and personality through their actions and expressions. Announcers present information and commentary on particular subjects, and may interview guests or act as a master of ceremonies at a special event. Art Directors design the overall style of written media, product containers, television and film productions. Dancers and choreographers use motion and their bodies to convey ideas or tales to their audience. Film and video editors and camera operators create and edit video imagery to entertain or inform an audience of a variety of events. Multimedia artists and animators create two- and three-dimensional characters and models as well as visual effects for video or film use. Musicians and singers perform using instruments or their voices for live or recorded performances. Set and exhibit designers create spaces to help actors convey a story or to provide a setting for exhibit pieces that reflects the tone of that exhibit. Top executives plan strategies and policies to help an organization achieve its goals and growth projections. Writers and authors create unique written content for websites, advertisements, stories, informational pieces, scripts for actors and songs. The average overall wage for a director as of May 2010 was $68,440. 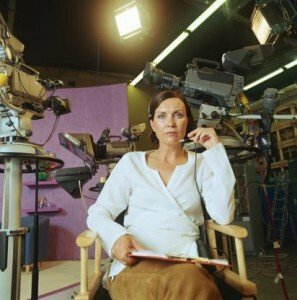 There was a large difference based on the type of director, with video and motion picture directors averaging $92,820, cable program directors averaging $81,290, broad cast television and radio directors averaging $54,120 and performing arts directors averaging $51,960. Positions for directors are expected to grow as fast as average, around 11% between 2010 and 2020. Freelance directors are expected to see faster than average growth of around 16% as independent movies become more popular. This career has intense competition, with directors who have movie experience having the best chances for career advancement.